We’re currently eight weeks into SIP, and it’s kind of scary to think how quickly time has passed. Though we had many challenges to overcome during our time in SIP, we were also able to accomplish so much as a team. Working as a team is actually harder said than done, especially if it’s with five other people you had never met before. 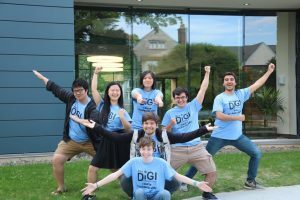 When Melody Cheng, Xijie Guo, Chloe Tibets, Tolga Sen, Leo Bunyea, Maxime Gautier and I first came together, all of us were pretty excited about making a game and wanted to make sure that everyone would have a good time during the summer. However, these first few weeks were essentially our honeymoon phase, when we saw each other through rose-colored glasses. Because our team consists people from six different institutions (RISD, Mt. Holyoke, Becker, UMass Boston, WPI, Berklee and Swarthmore, of course), we would inevitably bring different ideologies on how a game should be produced. At the same time, people from different disciplines (i.e. programming, art, music) had to learn to communicate with each other and understand the constraints they had to work under. With all these differences in perspectives and communication, it was inevitable that we would eventually delve into disagreements on how the game should be created. I would be lying if I were to say everything was sunshine and rainbows. However, having disagreements over the game isn’t necessarily a bad thing; it just goes to show that we all want what’s best for the game, but approach it in different ways. Part of working as a team is understanding that conflicts are a fact of life and that they won’t go away any time soon. The best of dealing with these issues is to reach out and communicate, and find compromises so that everyone’s voices can be clearly heard. When everyone is on the same page, we are able to accomplish so much more than when we work on our own. Being a part of SIP is a journey in itself, as it involves meeting new people and understand how different facets of game development feeds into the project. At the same time, SIP allows us to directly interact with the players and gives us insight on how media can be translated from creator to audience. Though making games is not the easiest task to do, having an opportunity to create a game for other people is a gift in itself.